Loop coasters were more popular than imagined in the early 1900s. When most people think of roller coasters, they picture them in amusement parks. However, documentation of permanent roller coasters at fairs and exhibitions goes all the way back to at least October 1904. With photographic evidence of a standard Prescott “Loop the Loop” at the York Fair in York, Pennsylvania. Roller Coasters were far more popular than imagined at the turn of the last century. This real photo postcard shows two similar views. 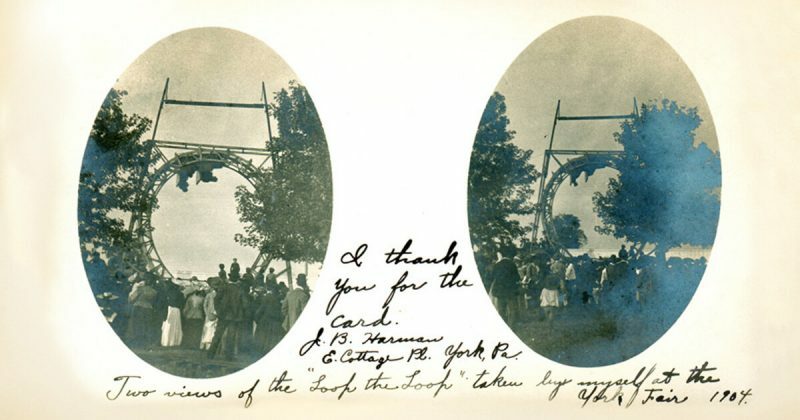 The card was sent to a young lady on Staten Island postmarked March 9, 1905 – 6 months after the 1904 edition of the York Fair had concluded. Why the card was held for so long is a mystery. Prior to this discovery, Flip Flaps and Loop Coasters had only been built as permanent attractions at Coney Island, Atlantic City, Olentangy Park, Columbus, Ohio and a few other places. Amusement Park Historian Mike Chew also shared news of an installation out his direction. A small fair in Vallejo, California (across from Marine World) apparently had a side-friction fairgrounds “woodie” prior to 1910. 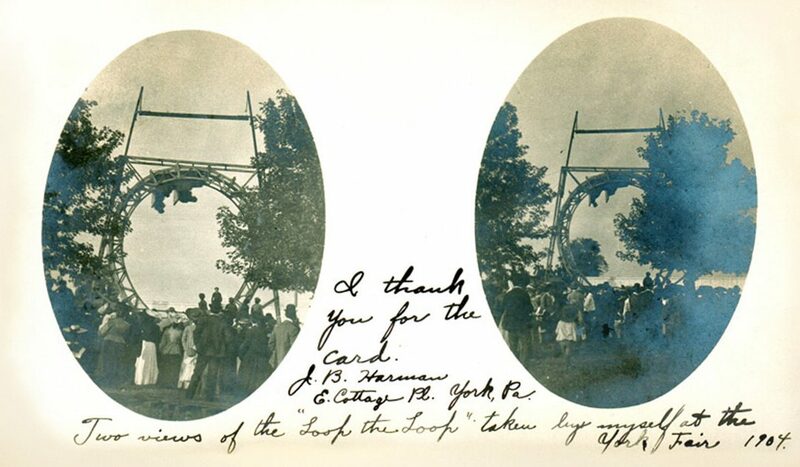 This postcard provides photographic evidence, confirming that roller coasters were far more popular than ever imagined at the turn of the last century. People were not content to travel to their nearest amusement park (perhaps there wasn’t one where they lived). Therefore, the exciting new invention, the roller coaster, came to them!